About two years ago, I opened the sort of e-mail message writers dream of receiving—an acceptance letter for a novel I’d toiled over for years. The letter was from WildBlue Press, an independent publisher based in my hometown of Denver, Colorado. A small, aggressive outfit focused on true crime, along with a selection of mysteries and thrillers, WildBlue agreed to publish my thriller, Borderland. When I received my 10 complementary author copies of that paperbound novel, with its western-themed cover complete with shadowy organ pipe cactus, I realized I had achieved a lifelong dream to publish a novel. I’ve spent my career as a journalist; I wrote my first story for the local country weekly newspaper at age 16. No surprise, then, that my fiction draws heavily from reality, and that was certainly the case with Borderland. Not long after the publication in 1994 of my first non-fiction book—If You Poison Us (Red Crane), which revealed the devastation caused by unbridled uranium mining on Navajo lands—I grabbed a gig consulting for a land developer on the U.S.-Mexico border, just west of El Paso, Texas. The project included housing, business and industrial sites, warehouses, and a port of entry. As I looked from the construction plans to the nearby border—nothing but a barbed-wire fence shimmering in searing heat—I was stunned. The site would make an ideal setting for a drug-running thriller! Rather than buckle down and write that novel, however, I accepted a Fulbright scholarship to teach journalism in Eastern Europe. So began more than 10 years of work and travel in some of the most far-flung and remote regions of the world, and my efforts to complete a string of books about largely unknown tragedies in those places. Following a year spent in Uganda, for instance, I wrote First Kill Your Family (Lawrence Hill, 2009), detailing the horrors of cult militia leader Joseph Kony and his army of child soldiers. In Somalia, I researched and wrote Pirate State(Lawrence Hill, 2001), about the chaos and terror caused by modern-day pirates. I went deep into the Democratic Republic of the Congo to research the illegal mining of minerals essential to the computer-chip industry, which led me to compose Consuming the Congo (Lawrence Hill, 2011). And after putting in a year in Afghanistan in 2004, I returned there in 2012 to research and put together a book about the people there, and how nearly three decades of war had shaped the realities of their lives. My labors resulted in Above the Din of War (Lawrence Hill, 2013). Finally, having put in a full decade overseas, I returned to the United States and to familiar territory … just as drug running and related violence on the U.S.-Mexico border peaked. Months of travel and research culminated in The Dangerous Divide (Chicago Review Press). During my time spent on the U.S.-Mexico border, I found myself still haunted by the fictional story I had conceived before heading off to Europe. Now, though, I had more material to use in my plot, thanks to the research I’d done for my non-fiction books. And I had confidence enough to write what would become Borderland. But as I sat down to do the work, I found myself staring at the blank screen of my laptop. I needed a main character, so I drew on what I knew best: journalism. My protagonist became Kyle Dawson, a world-wise war correspondent who’d never lost his small-town roots on America’s southern border. 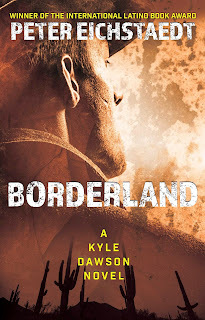 The borderland developer became Dawson’s estranged father. What would Dawson investigate? A murder, of course, and that became the killing of his father. It gave Dawson conflicting emotions and motivations, personal and professional. Dawson needed local ties. Those could be most interesting if he was of mixed ethnicity, Anglo/Hispanic, and bilingual so he could move back and forth across the border, from one world into another. So while Dawson’s father was the dead gringo developer, his mother would be Mexican and living in Juarez—long separated and divorced from his late father. To layer her character, I made the mother part Indian, from the central highlands of Mexico. For my second novel, Napa Noir—released by WildBlue Press in May of 2018—I drew again on my journalistic juices. My brother lived for many years in San Francisco, and we share an appreciation of wine. Between my global travels, I routinely visited him in the City by the Bay, and we’d travel to wine country, taking in several Napa and Sonoma wineries each time, with liberal samplings of their products. One day I read a story online about a winery owner who’d shot and killed his biggest investor, and subsequently died during a shootout with local police who rushed to the scene. To my mind, owning a vineyard in the Bay Area would be heavenly. What, I asked myself, would drive someone to shoot and kill a financial backer, then engage the local constabulary in a gunfight? Like all good journalists, I suspected a story behind the story. And that’s how I structured Napa Noir. I started with the murder, and again using a journalist as my main character—this time Dante Rath, an investigative reporter turned wine editor—I revealed the why behind the double murder. As I did my research, I learned a lot about wine and grape harvesting, and I came across a fermenting controversy over grapevine pesticides. It was perfect for my story. So, why use journalists as main characters in my crime fiction? I love private investigators, always have. I cut my teeth reading Dashiell Hammett and Raymond Chandler. But after a couple of decades in the reporting business, I realized journalists do much the same work as private investigators. Only they don’t carry guns. Was that a problem? Nope. Rather it was and remains a challenge, one that I’ve solved by giving one of my main characters friends who carry guns.